Combining UPC and EAN barcodes for your product packaging. UPC barcodes are 12 digit barcodes and are used exclusively in the United States and Canada. You can convert a UPC barcode to an EAN, but you cannot go the other way. This is because the Country Code for both the U.S. and Canada is zero. EANs are 13 digit codes and unlike UPCs contain a country code. When you purchase barcodes from Nationwide Barcode, you receive a few things including a spreadsheet of numbers and barcode graphics. The spreadsheet will have a list of both the UPC number and the EAN equivalent (or variant). 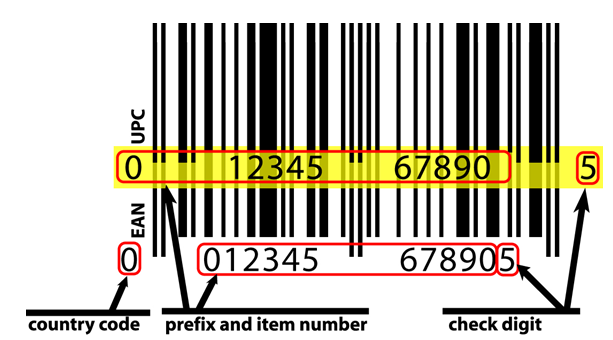 Since the mathematical computation for determining the check digit is exactly the same for both the UPC and the EAN, the additional number for the EAN is a zero which doesn’t doesn’t affect the barcode’s check digit, you can see in the illustration above that the only difference is the extra number below the EAN barcode graphic. The leading zeros are nulls, meaning that they don’t get recognized, 01234 turns into 1234, 001234 turns into 1234, etc. Here is our solution for the addition of a barcode if you are planning on selling in different parts of the world. Simply use the UPC barcode graphic and below typeset your EAN number. 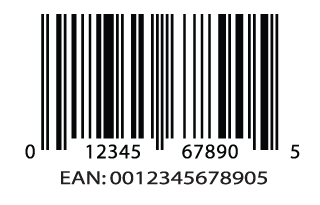 Since the graphic for both EAN and UPC are the same and the only difference is the addition of a leading 13th digit (zero), this will solve the issue of having to repackage or relabel for countries that exclusively use EAN barcodes.